According to statistics collected in the National Gardening Association’s (NGA) 2004 and 2008 Environmental Lawn and Garden surveys, the number of households in the U.S. that practice environmentally friendly gardening techniques increased from an estimated 5 million in 2004 to 12 million in 2008. Although those statistics sound great for our country, as a whole, I wondered how many gardeners in the Washington DC Metro area are making similar changes in their gardens. Kathy Jentz, editor of Washington Gardener magazine, took a break from preparations for her Third Annual Tomato Tasting, for a short interview on the subject. Question: Have you noticed a trend towards more eco-friendly gardening among your readers and fellow gardeners? Kathy’s Answer: We have been publishing for 5 years and in that time I have noticed an increase in questions about earth-friendly gardening practices. I'm hearing from many who have stated they are seeking to reduce the size of their turfgrass lawns and who are trying to attract wildlife to their yards. In non-gardeners I also see that trend. 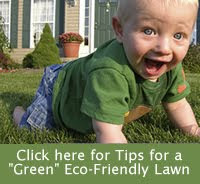 They are asking about lawn services that are truly green, not just in name only. Kathy’s Answer: I see a lot more interest in adding native plants to gardens, although I think the trend of using ALL natives has hit its peak and is now tapering off to a more moderate use. Gardeners are working in natives where they can, instead of going whole hog natives-only. Gardeners are saving water and planting more drought-tolerant varieties. Many are investing in rain barrels and are even talking about cisterns. Most of the gardeners I encounter were already avoiding chemical herbicides and pesticides except as a last resort. The last few years just seems to reinforce that conviction. Many now want to cut out any gas-powered garden and lawn tools, as well. Question: Vegetable gardening is certainly one type of gardening that seems to lend itself to "organic" gardening, because of the health aspects of not using chemicals. Do you think vegetable gardeners are more concerned about practicing eco-friendly techniques than perhaps flower gardeners? Kathy’s Answer: I would not say they are more concerned, but certainly equally as concerned. Gardeners are very aware that what they put into the soil is what they get out of it - be it an ornamental plant or edible one. They know that organic is the most healthy and sustainable practice. I do see more ornamental gardeners adding vegetable beds and fruit trees to their gardens. They are better able to control what goes into their food that way and I think they also enjoy being able to grow their own food. The popularity of cooking shows has helped feed into this trend, so to speak. People are a great deal more aware of their food sources and food quality these days. Question: What do you think is motivating more people to practice environmentally friendly techniques? Are people doing it for their families, the planet, for wildlife? Kathy’s Answer: I think it is out of personal conviction, though the influence of peer pressure cannot be discounted. If your neighbors have on sprinklers all day and spray everything down with chemicals, you think that is "the norm." But if none of your neighbors do those things, it probably would not occur to you to do them either. Question: Are gardeners being influenced by any particular people or groups? Did the White House Organic garden encourage more organic vegetable gardeners? Kathy’s Answer: The White House organic edible garden seemed to have most influence on people who had never gardened before, rather than current gardeners. I see current gardeners being most influenced by what they see in garden centers, in gardening publications, and what they see at local public gardens. They are very visual and always looking out for what is new, improved and problem-resistant. Gardeners want beauty, but they also want gardens that are as low maintenance as possible. Gardeners often swap plants with neighbors or with fellow garden club members. In that way, their plant selection is almost viral. Thanks, Kathy, for taking the time to share your thoughts on eco-gardening. I especially like your comments about how gardeners learn from their neighbors and fellow gardeners. It’s a good lesson for all of us to try to set a good example with our gardening practices and even the choice of plants that we share at plant swaps and with fellow gardeners. Kathy Jentz worked for 15 years in association publishing (both trade and professional organizations). She saw a need for gardening information specifically for the DC (MidAtlantic) area and started Washington Gardener Magazine in 2005. She is President of the Takoma Horticultural Club and on the board of the Silver Spring Garden Club. Here is a link to Kathy's Washington Gardener Blog, one of my local favorites. Washington Gardener magazine, is the gardening publication published specifically for the local metro area — zones 6-7 — Washington DC and its suburbs.